Keith Stover, vice president of finance for the patient revenue management division at Duke University Health System, has called on a handful of healthcare consultants over the years to help keep his finger on the pulse of industry best practices, tackle population health, and to get his team through the headaches of transitioning to ICD-10. But recently, he's been turning to consultants for their help in navigating the political uncertainty surrounding the healthcare industry today and planning for the possibility that the number of uninsured will rise and put a strain on the Durham, N.C.-based system's finances in the future. "There's so much uncertainty about what the Affordable Care Act is going to look like a year from now. What's Medicaid going to look like a year from now? The answers are pretty scary, so you have to begin thinking, what do we do if five years from now or three years from now our reimbursement levels are 10% lower than they are today?" Stover said. As healthcare providers and payers grapple with those questions, that same uncertainty has funneled new business to consultants who try to provide the answers. Healthcare consultancy firms are increasingly tasked with deciphering the political tea leaves surrounding the GOP's push to repeal the ACA, an effort that has stalled but isn't dead. Healthcare providers and insurers are flocking to consultants for help navigating the uncertainty surrounding the GOP's push to repeal the Affordable Care Act and to plan for possible outcomes. Consultants are also tackling projects to manage costs and implement value-based care models. They are advising providers and insurers on how to respond and stay afloat if congressional Republicans succeed in overhauling the ACA, the commercial insurance exchanges, and government programs such as Medicaid. Bipartisan analysts and the Congressional Budget Office have warned that several ACA replacement bills backed by the GOP would increase the rate of uninsured. Hospitals fear the amount of uncompensated care they deliver would rise, squeezing their margins and causing some to shut their doors. And health insurers face losing a big source of enrollment and revenue if state funding for Medicaid is cut or the ACA insurance exchanges collapse. At the same time, consultancies are urging healthcare organizations to focus on the tasks they believe will remain imperatives regardless of what happens on the Hill—reining in costs and moving forward with value-based care and alternative payment models. "No matter what the end-point for the rules looks like, those are still going to be important things to get right," said Michele Mayes, vice president of clinical and operational improvement at Quorum Health Resources. The implementation of the ACA brought with it a deluge of new regulations and a need for consultants to aid healthcare organizations in complying with them. 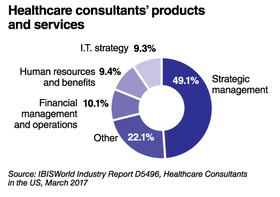 That helped boost the healthcare consulting industry's revenue to $5.6 billion in 2017, an increase of 7.1% over the past five years, according to market research firm IBISWorld. Consultants say that business slowed following the 2016 presidential election, as healthcare organizations waited to see what direction a Trump administration would take on healthcare policy. But consultants are now busier than ever as they help hospitals and payers plan for any possible scenario. "A central tenet of our business is that uncertainty is good for business," said John Gorman, a former CMS official who is now a D.C. consultant for health plans. His customers have been asking whether to offer products in the struggling insurance exchanges, enter the Medicaid market or expand their Medicare Advantage offerings—arguably the safest market for insurers. Hospitals and health systems that are already dealing with razor-thin margins want strategies for handling an influx of uninsured patients that they fear would arise from proposed changes to the Medicaid program. "For us, that was generating a large amount of work," said William Bernstein, chairman of consultancy Manatt Health. "We've already been working hard at developing a plan and strategy and process around a much more effective way at managing the uninsured," said Brian Paradis, a senior partner at Tampa, Fla.-based consulting firm CSuite Solutions. Other consulting firms have urged their clients to look beyond the political noise and focus on the fundamentals: managing costs, becoming more efficient and improving quality. 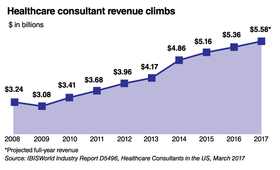 Cost has always been top of mind for payers and providers, but there's a heightened sensitivity to it now, consultants say, with overall healthcare spending topping $3 trillion in 2015. Hospitals are starting to see their patient volumes slip as they get better at keeping patients healthy and out of the hospital. Moreover, as more patients enroll in high-deductible health plans, they are thinking twice about going to the doctor, said Brian Sanderson, a managing principal at Crowe Horwath, which provides consulting services for providers. When patients do need care, employers and insurers are directing them to get it in less-expensive outpatient facilities, a trend that has also squeezed hospitals' earnings, he said. Meanwhile, healthcare providers continue to take on more financial risk for patient care. 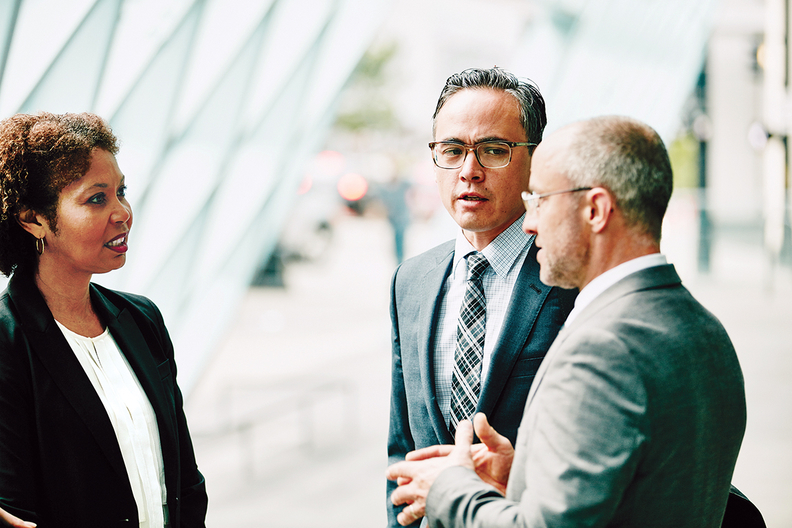 Those realities, coupled with the political uncertainty around the ACA, mean cost management is growing in importance even as it becomes more difficult to accomplish. "All organizations recognize that in times of uncertainty, in the short run and the long run, recognizing that there's a ceiling on price, getting your economic house in order is an issue," said Dr. Kaveh Safavi, senior managing director for the global healthcare business at Accenture. Most healthcare companies have already done the "easy stuff" to strip out costs, such as managing beds, squeezing savings out of the supply chain and changing up staffing, Safavi said. To get beyond that, Accenture is emphasizing the deployment of digital technologies to ramp up productivity. Providers are seeking to understand and manage the total cost of an episode of care across the continuum of the healthcare system. Managing costs on a per capita basis is "more important today than five years ago, and it's because so many organizations are signing at-risk contracts" with payers including Medicare, Medicaid and commercial insurers, said Joseph Damore, vice president of population health management at Premier. "Across the country, that's growing very rapidly." Even though the Trump administration in August canceled two mandatory bundled-payment models and scaled back a third, Damore and other consultants believe the nation's push toward value-based care won't slow down. Bipartisan support for alternative payment models, such as accountable care organizations, and the Medicare Access and CHIP Reauthorization Act, or MACRA, remain strong. The rise of consumerism in healthcare is also likely to continue, driving a need among providers and payers for guidance on how to become more consumer-friendly and making the care experience more seamless and convenient, said Vaughn Kauffman, a practice leader and partner in PricewaterhouseCoopers' health industries unit. "That's another issue we talk to consultants about quite a bit: What are some ways that people are trying to deal with this idea that the patient is becoming more and more responsible for their healthcare expenses?" said Duke's Stover. "What are some unique and innovative patient-friendly ways to engage with them so that they can be flexible and be able to pay their bills, but we can also continue to get the cash flow we need to fulfill our mission? These are the things every health system in the country is wrestling with."